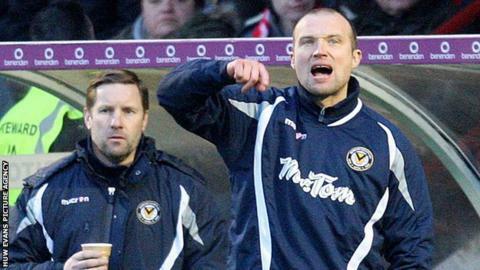 Newport County boss Warren Feeney believes he can shape the club into promotion candidates next season. The Exiles are currently 20th in League Two, five points above the drop zone. Current leaders Northampton are nine points clear after battling relegation for much of last season and Feeney believes his team can emulate them. "The (Northampton) players weren't even being paid (in October 2015), but stability is the key word in this division," he explained. "It is a long-term picture for me. My family are settled in the area and it is a great club. Is Friday night alright for Six Nations rugby? "I want to stay here for a long time and with good players, I think we could have a right chance (of promotion)." Feeney feels March will be a "defining," month for Newport, with eight games go play, and the manager may look to make further signings with such a gruelling schedule. "It is something we are looking at. It is likely to be a defining and important month," he said. "We would like to strengthen in the middle of the park." The manager confirmed that on-loan goalkeeper Mitchell Beaney has returned to parent club Chelsea with Joe Day back from suspension for County. Striker Deane Smalley has a knee injury and has returned to Plymouth, though his loan has not been terminated as the severity of the injury is assessed.